The sequence of two single pages was discovered by a thin line of watercolour pigments on the edge of the left page which matches the right page. 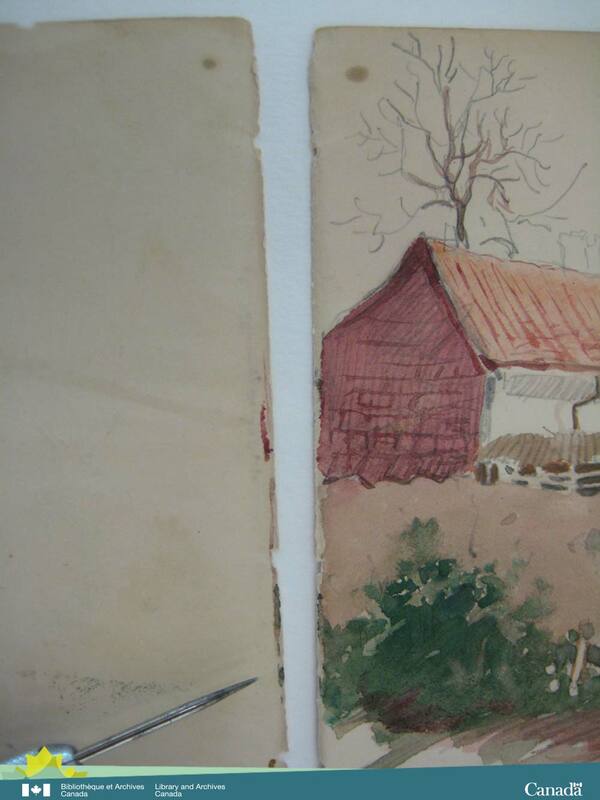 To begin to remedy these issues, the conservation team examined each sketchbook page by page to determine the original orientation and order of pages. This was accomplished by looking at all the little details—the media, watercolour, ink or graphite, the bindings and every instance of damage to the pages—and mapping them out very carefully. The team used various light sources, angling the light to view physical details of the paper, a microscope for magnifying every minute detail and the precise measurement of each page. Media transfer—this page was turned when the watercolour was still wet, transferring green and brown watercolour onto the facing page. The loose page is returned to sequence. The graphite lion on the left is mirrored in a media transfer onto the right page confirming the sequence of these two loose pages. Evidence that matched up two or more pages in a certain sequence was documented and the long process of revising the page order began. 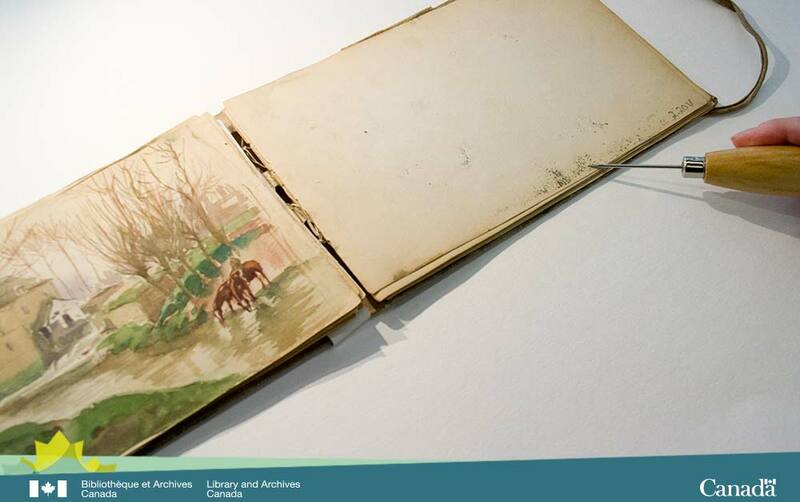 Each detail was catalogued in a template which really helped to develop an understanding of the sequence for each sketchbook. 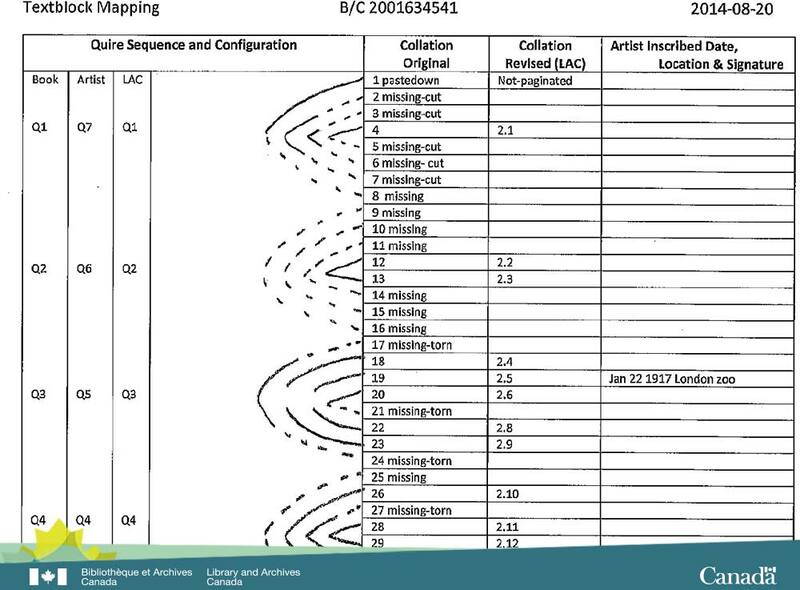 The page mapping template describes the contemporary sequence and the most likely original collation of the sketchbook. The documentation includes details of the number of pages per signature (grouping of sheets folded and stitched together); the number and location of missing, repositioned and blank pages; pagination; and paper type. Artist’s inscriptions are recorded as well. The first page mapping chart shows examples of media transfer and overlap. Media overlap would have occurred when Stark was actually sketching or painting as the media was applied beyond the intended area or page. Media transfer happened after sketching or painting when the sketchbook was closed and pages were in direct contact with either wet or friable (crumbly) pigments. In both cases, media was visible on the preceding or subsequent pages and provided evidence of the original order. In the next part, we continue to explore page mapping by looking at damaged pages. This entry was posted in Our Collection and Facilities and tagged Art, Conservation, conservation Wednesdays, First World War, military artist, William Redver Stark by Library and Archives Canada Blog. Bookmark the permalink.